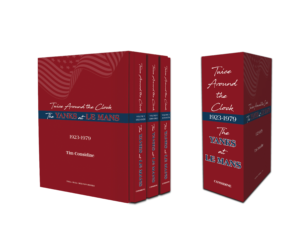 Spectacularly illustrated and spanning from the first “Grand Prix d’Endurance de 24 Heures” in 1923 through 1979, Twice Around the Clock – The Yanks at Le Mans is told primarily from the point of view of America’s motorsports heroes, as much as possible in their own voices, from interviews conducted over 26 years. These personal stories are framed by a narrative to set the stage, year by year. Because it would be impossible to tell every participant’s story in detail, the depth of attention given is determined as much by entertainment value as historical importance. There are many books about Le Mans, good books, but they rightly concentrate on the races and results. 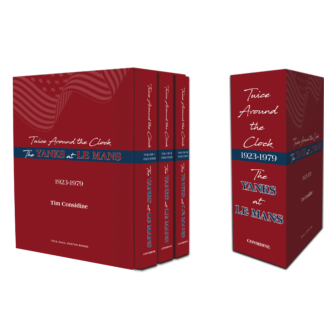 Twice Around the Clock – The Yanks at Le Mans complements these accounts and adds to the body of history with untold personal stories of American drivers, team owners, mechanics and witnesses – like the American soldiers stationed in Europe who often ended up helping the teams. These volumes are about their experiences at Le Mans, on and off the track. And, oh, the stories! Frank, sometimes blunt, personal accounts make history human – and these volumes unique. Each is close to 120,000 words in length with 300-400 black and white and color images from around the world – many never seen before. While the narrative stresses the personal, there are many new details for aficionados; and for historians and academics, comprehensive appendices with complete statistical records for every American driver, car and engine ever to compete at la Sarthe, as well as citations for every quote.